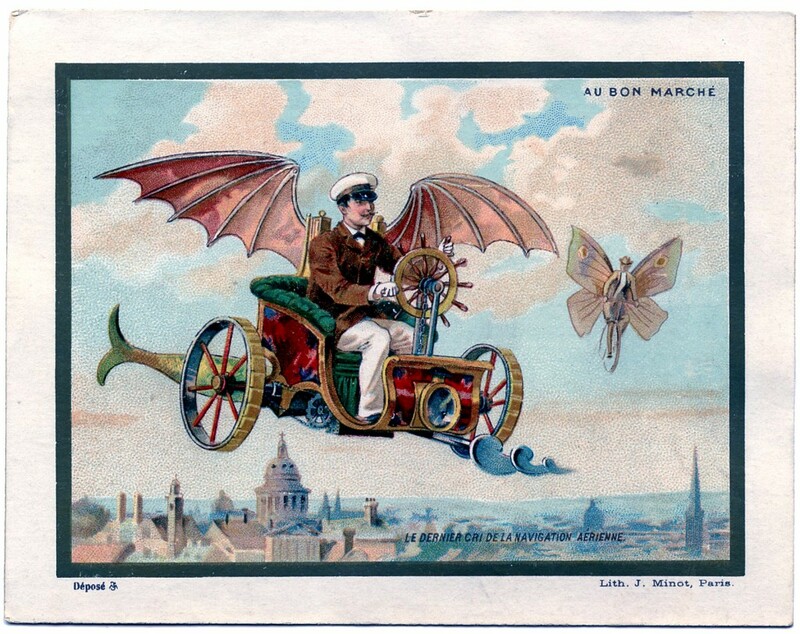 This amazing image is an old Advertising card from a French Department Store! This one shows a man in some sort of Flying Machine. The Machine has Bat Wings, a Fish Tail and a crazy looking corkscrew thing in the front! There’s also a Butterfly Man floating about in the background. Great for your Steampunk Art pieces or this one might make a nifty Father’s Day Card! This is a great steampunk image! I love it! Thanks for posting it! What a great image! I love the corkscrew front and the fish tail behind. So neat! Thanks for sharing. How much fun! I’m singing “those magnificent men in their flying machines….”! Wow! This one is so fun! Thanks Karen! Thanks everyone!! I’m so glad you liked this crazy card!! Thank you for all the beautiful pictures. My girl LOVES steampunk! Thank you dear! than you, this is amazing! Thank you – most unusual! I love this one. Thank you! Love it! I’m not sure what I’ll use it for, but I’ll find something! Thank you! Hi Karen – just love this image and thought you might like to see what I’ve done with it!!! Forgot to say I used it for The Three Muses today. I just found this image and love it so much! I laughed out loud when I saw the auger on the front because my first thought was “maybe that’s how he lands – just point that down into the earth”! Thanks for sharing all your wonderful images! !